ISLAMABAD, Pakistan (CNN) -- No running water, no electricity, no fuel and little food. 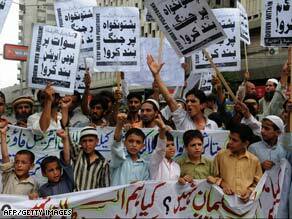 Pakistanis displaced by fighting demand government assistance during a protest Sunday in Karachi. International Red Cross officials are "gravely concerned" about the stark situation in Pakistan's Swat Valley, where a monthlong offensive against the Taliban has displaced more than 2 million civilians. Members of the International Committee of the Red Cross arrived in the Swat Valley this weekend for the first time since the onset of violence there. The organization evacuated more than a dozen people in need of urgent medical care and called for an immediate humanitarian response. "The people of Swat need greater humanitarian protection and assistance immediately," Pascal Cuttat, head of the organization's delegation in Pakistan, said Sunday. "The ICRC will do its utmost to meet those needs without delay. Given what we have already seen on the ground, we are mobilizing additional resources, but safe and unimpeded access to the area remains essential for our teams to deliver." Those who have left their homes tell of the whole valley being turned into a battlefield as citizens flee on foot, many of them with no shoes. Some fall ill from sun and heat exposure, particularly infants and those already weak and sick. According to the most recent United Nations numbers, about 2.4 million Pakistanis registered as displaced persons since May 2. Currently, the clashes are concentrated near Mingora, the valley's largest city. "People have been blocked for weeks," said Daniel O'Malley, who led the ICRC team. "There is no running water, no electricity, and food is scarce. There is no fuel left for generators and most medical facilities in the district are no longer functioning. Phone lines are down, so people have been cut off from the outside world and are anxious for contact with relatives who fled the area." The Red Cross team visited Khwazakhela hospital, one of the few medical facilities left in Swat Valley, to deliver supplies and found a small group of hospital staff members struggling to work without water, electricity or supplies, O'Malley said. "They simply cannot cope with the influx of patients," he said. The team evacuated 14 patients. Meanwhile, one soldier was killed in a roadside bombing, and security forces killed two militants in the Swat Valley over the last 24 hours, the Pakistani military said on Sunday. The military said an unknown number of slain militants were found in a training facility destroyed by security forces in Shangla district, and a government girls' school at Baiderra was torched by militants. The Pakistani military said on Saturday its security forces have taken back the city of Mingora from the Taliban, calling it a significant victory in its offensive.